I happened to open this email a few days ago and just had to share this post with you. So good! As you know from my Winter/Spring video series, I am a diehard believer in healthy routines and habits. Enjoy and love to hear your thoughts so leave a comment! When trying to change a habit, the cold turkey approach is most often a recipe for frustration. I find that little itty bitty incremental shifts in behaviors is usually a far better way to ensure long-term change. Once you start changing a habit with baby steps, you can build on that success. That walk around the block becomes too short, so you extend it to the next block. You find you don’t stop at 5 sit-ups, you keep going and add a couple more. Do you reach for the sugar packets every time you have a latte, without even considering going without? Be aware of your actions and realize that you do have the choice to skip the sugar. Know that as you are living out your calling, through the power of Jesus, you are capable of achieving whatever it is you are called to do. You can conquer those bad habits, and you can adopt those good ones. But the entire house of cards can fall down if you don’t start with a solid foundation of confidence in your God-given ability to do so. What? Failure? Include it? Yes. If you aren’t failing now and again, then you aren’t challenging yourself. The person who never risks anything obviously isn’t going to fail, because they are playing it safe. Failure is just a stepping stone on the way to success! There you go. Six truths about the power of habits in your life that help you find success. Which truth about habits resonated with you? Let me know in the comments. And if you found this article helpful, please share it with your friends! 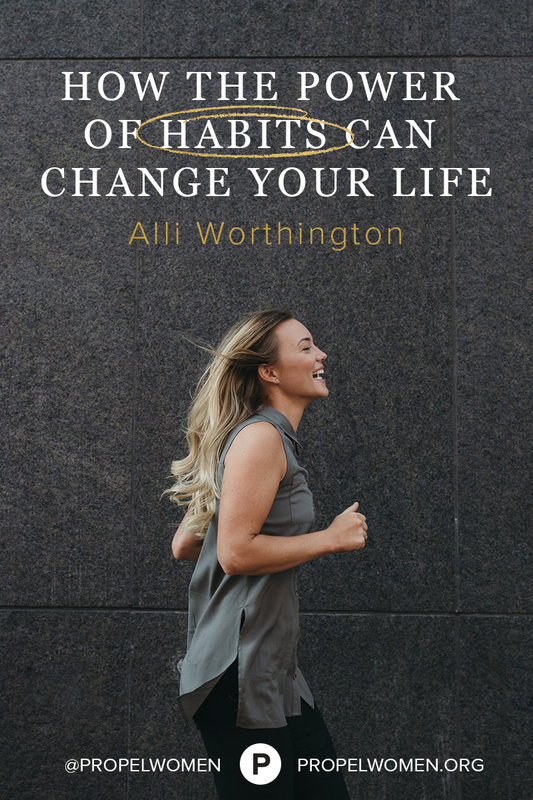 Alli Worthington is the author of Breaking Busy: How to Find Peace and Purpose in a World of Crazy, speaker, blogger, and the Executive Director of Propel Women. Alli has helped individuals, small business owners and Fortune 500 companies be more successful. She lives outside Nashville with her husband, Mark, and their five sons. You can connect with Alli at AlliWorthington.com.